Double Bonus Prize Pool, New Host City Bidding Process and New Boat Design Specification. The ISAF Match Racing World Championship, which is in its 22nd year and is now known as the World Match Racing Tour (WMRT), today committed its future to monohull match racing and unveiled its future strategy which has been designed to ensure the growth and sustainability of the discipline. The strategy will focus on ensuring the tour continues to provide close combative head-to-head racing. 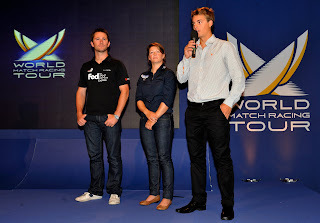 Today’s press conference, which can be viewed again at www.wmrt.com, revealed that WMRT will be doubling the tour’s bonus prize pool to USD 500,000 meaning sailors will compete for a total prize fund in excess of USD 1,750,000 in 2011. It was also announced that WMRT will be launching a new host city bidding process in the next 14 days which will add six new venues by 2013. To complement the addition of new cities and to ensure the Tour embraces developing technology, submissions will be invited from international designers and boat builders to create boats for the new events joining the tour. With the America’s Cup holders having clearly stated that they are starting with a clean sheet of paper by moving to catamaran racing for the foreseeable future, a void has been left in the historic framework of match racing. In order to address the void and create an effective strategy WMRT has undergone a thorough review process with its promoters, teams and sponsors as well as taking into account recent media reaction and public feedback. The findings are echoed by data from a recent survey conducted by Sail-World, which shows clearly that the majority of sailing fans surveyed want to see match racing conducted in monohull boats. WMRT CEO Jim O’Toole said that, “As rights’ holders we have a duty to act in the interests of match racing. The majority of people feel that the true essence of match racing is about intense, highly manoeuvrable, closely fought, head-to-head battles and we have developed our strategy to take into account these views. Feedback received by WMRT as a result of the shift in the historic match racing framework indicates that there is still a desire for a sailor and team design-based match racing series. WMRT President Peter Gilmour commented, “The decision by the America’s Cup holders to embrace catamarans means that it has moved out of the space which it had previously held as the pinnacle event in match racing and feedback that we are receiving indicates the interest remains." Any parties wishing to explore this opportunity should register their interest via www.wmrt.com or contact WMRT Tour Director Craig Mitchell by Friday 26 November. Should there be strong enough interest then WMRT will facilitate a forum to develop the concept.